I woke up this morning, my last full day in Japan, with the realization that I’d really accomplished everything I’d set out to do while here, I was running a little low on cash, and I should find a cheap way to get some breakfast and kill the morning. My hotel is in easy walking range of Tokyo Tower, so what’s what I went with. I’ve visited the tower probably half a dozen times before, of course, it’s a beloved tourist attraction even if it loses its ooh and ahh factor pretty quickly. You get to go up quite high and look out across Tokyo, and on a clear day you can even catch a glimpse of Mt. Fuji, 97km away. Today was not a clear day. I could barely make out the Shinjuku Metropolitan Government Building, and that’s 6km away. 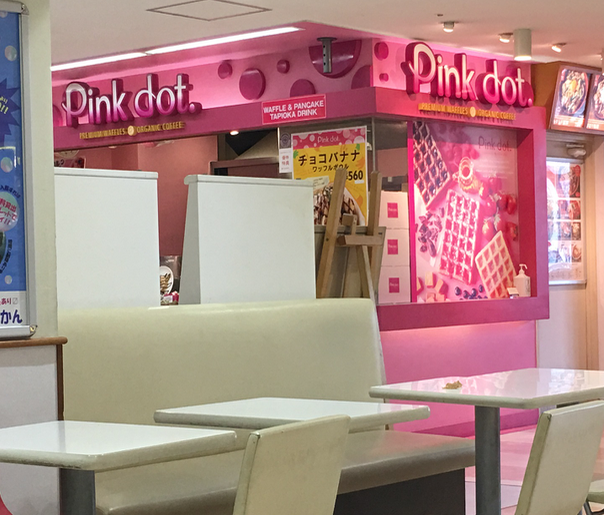 Anyway, before I went up, I went to the food court and found that there is a business called “Pink dot” (no relation to the failed mid-90s delivery service I am sure) that sells both pancakes and waffles, which are recognized as breakfast food by every country on this little blue planet of ours. I will, however, admit that the manner in which Pink dot prepares their breakfast-appropriate food items is a little more…cake, than pancake. There were pancakes! Three of them! A fairly generous serving of pancake! With the pancakes came a mountain of whipped cream. From slight color and consistency differences, it looks like the mountain was made of two kinds of whipped cream, though I could not begin to tell you the difference. 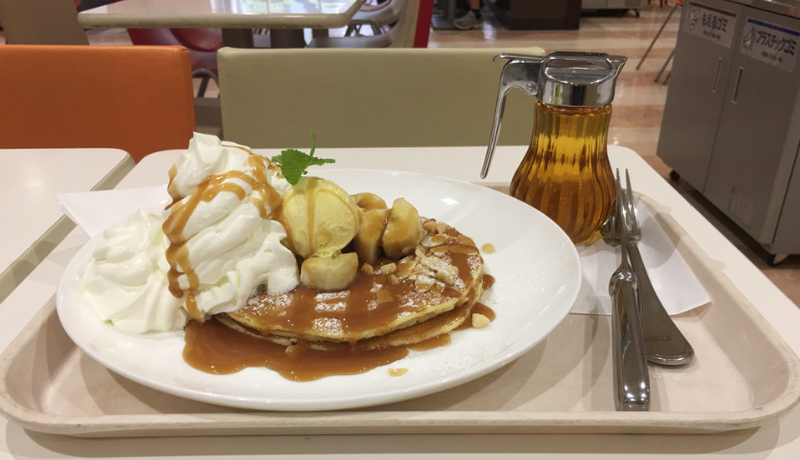 There was a scoop of banana-flavored ice cream lest the whipped cream not adequately fulfill your cream needs, some slices of banana, powdered sugar, and caramel sauce poured and/or drizzled over the entire thing. There was enough sugar here to keep a small child – or a fully-grown man who should have known better – on a sugar high for HOURS, is what I’m getting at, and the bottle of syrup perched on the tray as if to say “just in case you’ve lost all sense of human dignity, add some extra sugar” really just added to the entire affect. I’ve had plenty of Belgian waffles over the years, and there is always the depressing point where you run out of whipped cream and yet there is a solid quarter of the waffle left. These were decidedly the other way around. Oh, and they only cost about six bucks. Japan really is a pretty reasonably-priced place to visit. For extra “oh, hell, let’s just see what my body can still handle”: while I was making my way through the plate full of sugary excess, I noticed an advertising sign for something even WORSE for me, and I decided that I would need to come back and eat it for lunch. More on that tomorrow.